(CNS): While auditing government accounts may require some serious mental gymnastics from the Office of the Auditor General, trying to make sense of them keeps the number crunchers in their chairs for hours on end. So, to counter the sedentary effects of that work, staff recently took part in a health challenge. Joining forces with the team from the Information Commissioner’s Office, staff from the two agencies managed to collectively walk almost five million steps during the 'Workplace Walk-off Pedometer Challenge' from 17 January to 7 February. This worked out to 22 staff members covering some 2,000 miles in three weeks, or about 100 times the length of Grand Cayman. At a celebratory scavenger hunt and prize-giving on Saturday 8 February, Deputy Governor Franz Manderson praised the agencies for their achievement. Manderson said the pedometer challenge was worthy of emulation by the whole civil service, something that the organisers revealed may happen later in the year. “This challenge fits right into our objectives of promoting wellness, a healthy lifestyle and teamwork,” said Manderson, who also participated in the scavenger hunt. Describing the civil service as one family working towards a common goal, he stated that public sector workers would benefit from taking on the challenge of becoming healthier, while having fun and getting to know one another better. Auditor General Alastair Swarbrick, also a scavenger hunt participant, emphasised the importance of health and wellbeing at the workplace and at home. He was happy to see his staff “better and fitter”, he said. Audit Project Leader Ruel Huet picked up the first place trophy and a plaque for accumulating 864,907 steps during the challenge. Huet also earned the staff medal for achieving 5,000 steps or more per day, the most times for the entire challenge. 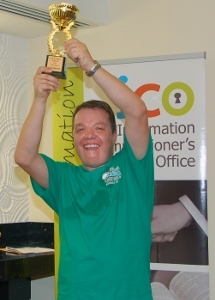 His colleague, Winston Sobers, collected the second place trophy and medal for 527,561 steps and Patrick Smith bagged the third place trophy with 390,518 steps. Other winners were Clara Smith from FOI and Acting Deputy Information Commissioner Cory Martinson – Biggest Mover, Female and Male respectively; and Gay Frye won Top Performing Female. To ensure that all counts were above board, the OAG “audited” the figures the participants submitted each day. All winners received a slew of donated items, including the top prize of a smartphone from LIME. At the same time, those who took part said there were other benefits to the competition: between them the top four participants lost 22.5 pounds. “We are deeply grateful to all our sponsors whose generosity made our challenge all the more attractive,” Audit Principal Patrick Smith said. Winston Sobers, who led the organising team, gave special thanks to LIME and all the other sponsors. Cut the power to the elevators! How about pedometer readings are linked to civil service pay? We pay for their health care so it makes sense if something is done to challenge the chronic obesity problems. That is a very positive news. The numbers crunchers do need some regular physical challenges to stay mentally sharp. Congratulation to all participants and sponsors!